It was a groundbreaking moment in medical history as surgeons around the globe donned virtual reality headsets to watch developments in a London operating theater before taking part in an operation being carried out on an National Health Service (NHS) patient. Details have emerged of an operation carried out by Professor Shafi Ahmed in the Royal London Hospital, Whitechapel, on Thursday, October 19, to remove a bowel tumor while being assisted by experts in Mumbai, India, and a private hospital in London. Recent advances in technology now allow medical specialists and experts anywhere in the world to share vital information and advice on medical procedures — almost as if they were actually standing right beside them. Thanks to the VR headsets, all of the doctors were able to access images and patient notes while discussing the keyhole surgery as it progressed. It is now hoped this could be routinely used in other hospitals within the next five years. They were using Microsoft's Hololens, a pair of glasses with built-in sensors and speakers that can display extra information on top of what users see in the real world. While the operation was fairly routine, Professor Ahmed said it had been both helpful and reassuring to get confirmation of what he was doing from his virtual colleagues. "In other cases, more tricky or complex, we can imagine people giving advice would be very helpful. Augmented and virtual reality have incredible potential, not only in the NHS but also to encourage collaboration to improve accessibility, equity and safety in developing countries," Professor Ahmed said. 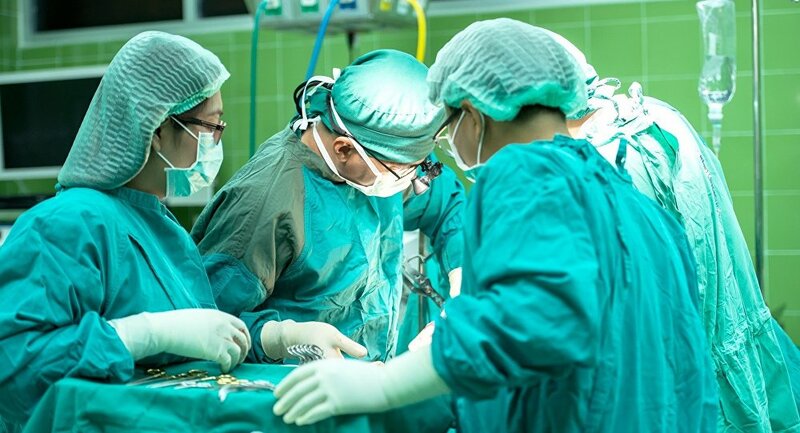 Surgical cases are normally discussed in advance by a team of doctors, however, in an emergency situation that is not always possible meaning extra assistance could prove invaluable. Professor Ahmed is no stranger to technology, having already been nicknamed the "virtual surgeon" after wearing Google glasses in 2014 to allow students and members of the public see what he saw during an operation. He has also founded Medical Realities, a company that uses immersive technology to train surgeons. Surgeons have already embraced robotics into their operating theaters and this trend is likely to continue at pace in the coming years. VR technology has now taken it a further step forward, improving communication and care for patients around the world, according to the professor. The unnamed female patient has made a full recovery and is expected to leave hospital imminently. There are, of course, many more uses of VR than first realized ranging from academic research through to engineering, design, business, entertainment and military. In many ways the possibilities are endless. The only stumbling blocks are time, costs and technological limitations, although these are being extended all the time as advances are made.